This attractive holiday tea ring "wreath" has a maple-caramel filling. In large mixer bowl, combine 2½ cups flour, yeast, sugar and salt; mix well. In saucepan, heat milk, water and shortening to 120-130°F (butter does not need to melt). Add to flour mixture. Add eggs. Blend at low speed until moistened; beat 3 minutes at medium speed. By hand, gradually stir in remaining flour to make a firm dough. Knead on floured surface until smooth and elastic, about 5 minutes. Place dough in lightly oiled bowl and turn to grease top. Cover; let rise until dough tests ripe. Punch down dough. Prepare Filling by combining all ingredients. Divide dough into 2 parts. On lightly floured surface, roll out each half to 18x12-inch rectangle. Spread with maple syrup and sprinkle with Filling. Starting with longer side, roll up. Pinch edges and ends to seal. Place each ring seam-side down on greased cookie sheet. With scissors, make cuts 1 inch apart through top of ring to 1 inch from bottom. Alternate cut slices, bringing one to center and next to outside of ring. Cover; let rise in warm place until indentation remains after lightly touching. Bake at 375°F for 20 to 25 minutes until golden brown. 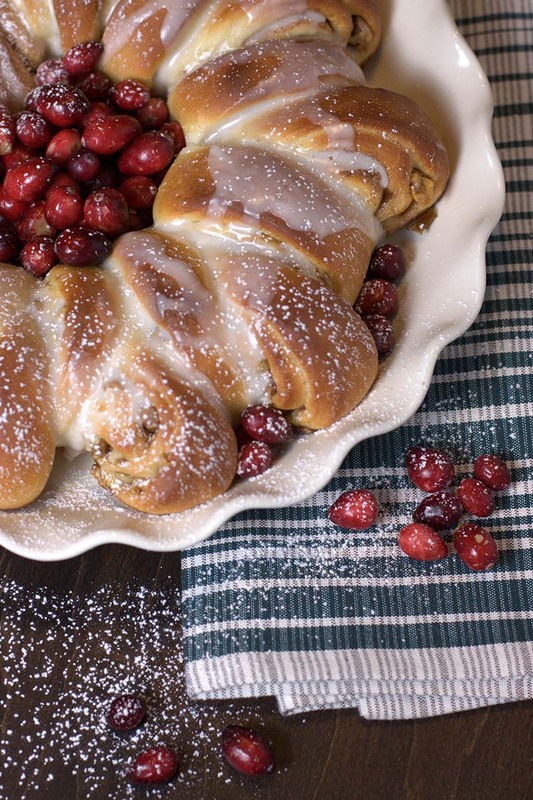 Drizzle glaze over ring and garnish with holiday fruits and a dusting of powdered sugar (optional). Serve warm or cold.